There's one reality that we all know way too well. As black people, we have to work twice as hard, twice as long and be twice as smart in order to reach the same place as the mediocre white man down the hall. Our parents pushed us to be better, do better and work harder because they knew that we wouldn't be rewarded the same opportunities as our counterparts. We internalized this. Scandal fans will remember when Papa Pope hemmed Olivia up and we felt as though he was talking to all of us. Even if you weren't watching, Black Twitter wouldn't let this go and it was all over the timeline. Photo: Giphy In a 2014 study conducted by Harvard Business review, we learned that black workers receive extra scrutiny from bosses and that education doesn't put people of color on the same playing field as our white counterparts. Unfortunately, this is something that we quite frankly didn't need research to prove to us. What exactly has living in this reality meant for us? We're over-exhausted to the point that we're in a romantic relationship with it. It's a part of our culture and we see nothing wrong with it. We are so overburdened with purpose that we are letting our desire to "make it" chip away at us day after day, month after month and year after year. We've all seen friends burn out, have a breakdown, or start to lose their footing, or the same has happened to us. Perhaps you haven't gotten to that point yet. If you're #TeamNoSleep, a fan of pulling all-nighters, scream "the grind never stops" at the top of your lungs or have said "I'll sleep when I'm rich (or dead)," then you're well on your way there. Photo: Giphy You might even be on the other side of this equation. We applaud our friends for working hard, making moves and grinding non-stop, but when have we stopped and ask them how they're doing? 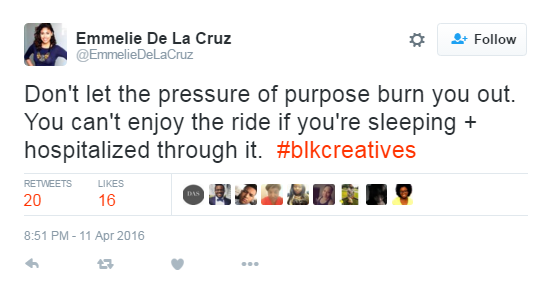 In April, @blkcreatives held a Twitter chat called "Dealing With Overwhelm," which explored this very topic. One tweet from the conversation reminded us that self-care isn't a luxury; it's a necessity. Photo: Twitter Moving forward from this toxic relationship will be a process, but it can be done. You can get started right now by challenging yourself to 7 days of unapologetic self-care, reading these tips about how to prevent burnout, trying one of seven resources for self-care or learning how to say yes to yourself by saying no. Are you ready to break up with over-exhaustion? We are!